NOVEMBER DISNEY EXTRAVAGANZA #6: Under Wraps (1997) – dir. Greg Beeman | Films Like Dreams, Etc. For my November Disney marathon, I decided to take a less conventional approach and also watch a few of the Disney Channel Original Movies alongside some of the more famous cinematic features. Hopefully I’ll have time to fit in some of both the “classic” and contemporary stuff; for now, however, I’d say that I’m off to a pretty interesting start. 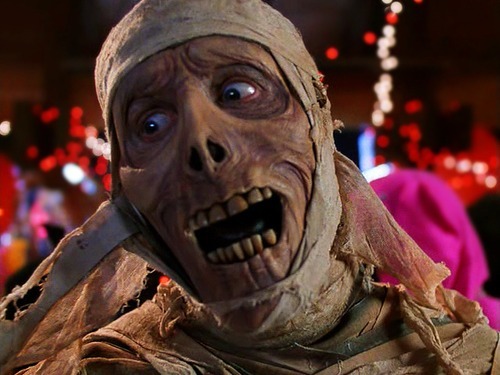 I remember watching Under Wraps as a kid when it first aired on the Disney Channel, and I also recall being fairly amused by it. It’s always one of the first I tend to bring up in nostalgic conversations (yes, even before Halloweentown) and perhaps it is at least a little responsible for my horror fascination (though not quite as much as The Nightmare Before Christmas). Unsurprisingly, it’s the kind of movie that ought to be left for the kids to have fun with and appreciate in their own ways. It carries the usual problems that tend to occur within made-for-TV flicks, particularly its extremely formulaic premise, awkward pacing, and even more awkward dialogue and acting. Sure, I wasn’t expecting anything more than mindless fun out of this one, but everything interesting about this movie could be completely boiled down to a singular statement: “Look! A mummy!”. The kids in the film do decent work with their material, especially given that they are clearly not professionals. I recognized Mario Yedidia – who played the film’s main protagonist Marshall – from Coppola’s Jack, in which he displayed a more considerable amount of range. The character flaws here are completely attributed to writing issues; much of it is stilted and steeped in a sense of humor that usually falls flat. I can’t say very much for the supporting cast either; they served very little purpose to the story other than to provide a comic foil (Adam Wylie) and an eventual crush interest (Clara Bryant). When the mummy does appear, however, just a tiny bit of life is finally breathed into the narrative. “Harold” is played by Bill Fagerbakke, who would go on to brilliantly voice-acting in Spongebob Squarepants, of which he is most famous for. Indeed in his physical acting, his grunts and groans could certainly be connected to Patrick Star, or at least a concept of the character in its infancy. The funniest moments of Under Wraps definitely come about whenever Harold is on the screen, particularly amidst one of the numerous fish-out-of-water jokes that come about. While the protagonists lack much necessary charm and the antagonists remain entirely unconvincing, the absolutely ridiculous slapstick humor from Fagerbakke saves this film from a potentially disastrous mischance. Under Wraps does come with a few little quirks that I particularly found interesting. For one, its sense of humor is relatively dark compared to some of the more sterilized programs available to children these days. There’s even a joke about dancing Nazis within the first few lines of dialogue! Also at the beginning is one of the coolest faux-films I’ve ever seen within the context of a fictional flick. Seriously, if one wants to simply seek out the best parts of the movie, there’s no better place to look than within the first 2-3 minutes of runtime. It really makes me wish that Warthead IV were an actual horror film and it were as awesome as depicted in this movie. With such a great setup, it’s no surprise that I’d be disappointed with the overall outcome of this film. Yet it’s also important noting that the target audience of Under Wraps would probably not be as cynically critical as I am now; and with that, I’ll leave it be. This entry was posted in November Disney Extravaganza, Reviews and tagged 1990's, Disney, Disney Channel Original Movie, Greg Beeman, horror, November Disney Extravaganza, Under Wraps. Bookmark the permalink. Pingback: Halloween TV (Movie) Party: Halloweentown (1998) | Films Like Dreams, Etc.